Thanks for all the great info, posting my experience here to give back a little: I recently ordered a replacement back for my 800 without knowing about the 2 variations. It appears that I own the 10mm version, but was sent the 8mm back - as you know the data connectors didn't align. However, with a little bit of work I was able to remove the usb/sd board from the 10mm case and put it in the 8mm case. The connectors now line up just fine. Be aware though that this will only work when replacing a 10mm case with a 8mm case. A 10mm replacement case will not work with an 8mm Garmin unit due to the circuit board width around the USB port. The width around the sd card slot is the same though. The usb port does sit a little farther back now than it used to, but it doesn't seem to affect charging or data transfer. I put a little silicone sealant over the area the edges of the circuit board and usb port. I'm hopeful that between that and the rubber port caps, water will stay out. 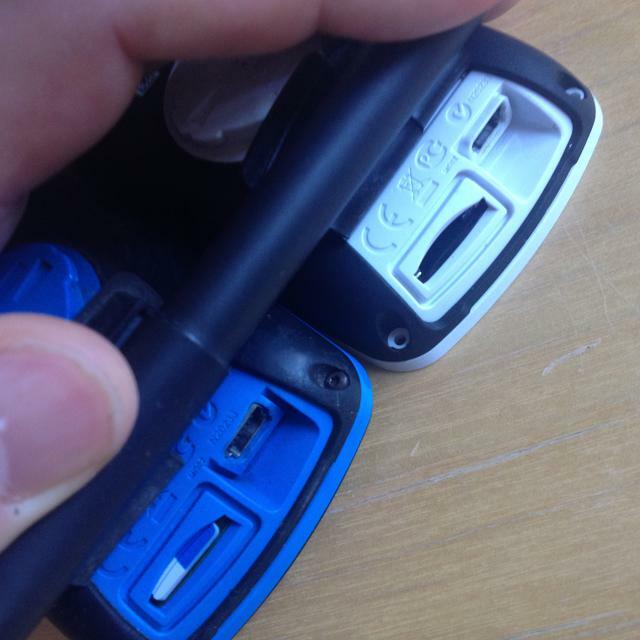 Also, You can tell which version you you have without opening it by externally measuring the area below the usb port. 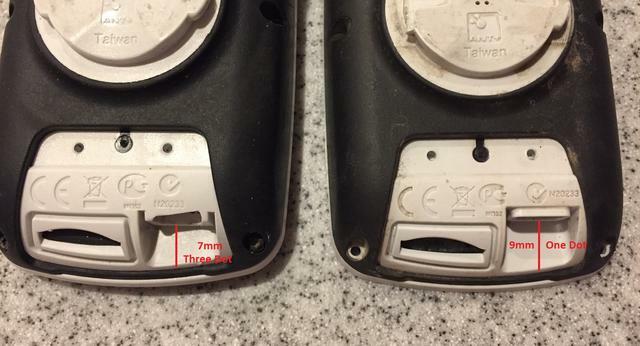 The 8mm (one dot) version measures about 9mm from bottom center of usb port to the edge of the black, and the 10mm version measures approx 7mm. See attached photo. Edited 1 time(s). Last edit at 09/24/2016 02:32AM by akcyclist. Thats a great idea and now I feel a bit silly not to have thought of that, but its pretty obvious I can see that now. Looking at it closer, it's quite easy even without measuring. The connector housing is different in shape and it's easy to reference how it lines up with other parts. Edited 1 time(s). Last edit at 10/01/2016 07:18AM by RJC88. USB port shape difference confirmed on my back cases. In addition, you'll notice the stamp "N20233" is below the check mark icon on the 10mm "three dot" case, while it's to the right of the check mark on the 8mm "one dot" case. Great info, very easy to tell which is which from a quick look at the ports now. You still have the spare case and looking to sell for cheap? I just busted the ears of my mount and measured (thanks to this thread) that I have a 10mm case. I'm not picky for colours - just one with ears please!